The Jazz Arts Group’s Inside Track series opens its 2013-14 season on Friday, September 6 at the historic Lincoln Theatre with the avant-garde funk jazz of the Dallas/New York City musician collective Snarky Puppy. With the release of their live, 2-disc album/DVD Tell Your Friends (Ropeadope Records), Snarky Puppy has gone from an underground secret to one of the most internationally respected names in instrumental music. The 3-time Dallas Observer Music Award-winning group (“Best Jazz Act” 2008, 2009, 2010) has, over the last four years of touring, gained a reputation for putting on a live show unparalleled in energy, virtuosity, and musicianship. They seamlessly fuse a deep knowledge and respect for musical tradition with sonic and conceptual innovation in a way that is able to reach the most critical- or most carefree- audience. Snarky Puppy is somewhere between a garage band and a collective, with over 25 players in regular rotation. The core of the group, which remains consistent, features Grammy Award-winners Robert “Sput” Searight on drums (God’s Property, Snoop Dogg) and Shaun Martin on keys (Kirk Franklin, Erykah Badu), as well as young organ prodigy Cory Henry (Kenny Garrett, Kim Burell) and multi-instrumentalist Louis Cato (Marcus Miller, Q-Tip, George Duke). Its members are mainstays with artists like Erykah Badu, Marcus Miller, P Diddy Dirty Money, The Polyphonic Spree, Snoop Dogg, Roy Hargrove’s RH Factor, Morcheeba, Tower of Power, Ari Hoenig/Adam Rogers, Justin Timberlake, Kenny Garrett, Yo-Yo Ma, Lucy Woodward, and Bilal, among many more. The group was conceived and is held together by award-winning bassist/guitarist/composer/arranger Michael League, whose creative grass-roots approach to a tougher-than-ever industry has created a unique musical animal. It is a three-headed creature: first, and most obviously — an original music ensemble. Second — a production team and session band for individual artists. Third, and probably most importantly — Snarky Puppy is a group of musicians unanimously and enthusiastically committed to music education and community outreach. Working with groups like ROAM (Roots Of American Music) in inner city Cleveland and the Music Lab at Jefferson Center in Roanoke, as well as giving clinics at over 40 colleges, high schools, and middle schools worldwide (League is faculty at London’s Institute of Contemporary Music Performance), the band has made a strong commitment to spreading a love of music and general positivity to a young generation looking for something real to hold on to. 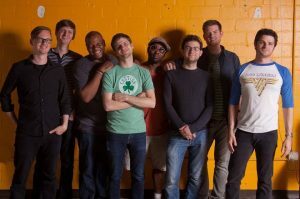 The Jazz Academy will also host a companion workshop with Snarky Puppy (Friday, September 6, 3:30 pm) prior to their performance at the Lincoln Theatre. Registration is required and available at www.jazzartsgroup.org. Currently, Snarky Puppy is touring to prepare for their next live, in-studio album/DVD, to be recorded over 5 days this winter. The band has released 6 albums so far: Live at Uncommon Ground (2005), The Only Constant (2006), The World Is Getting Smaller (2007), Bring Us the Bright (2008), Tell Your Friends (2010), and groundUP (2012).